Over the past 6 months, I’ve had quite a few orders. While I thoroughly enjoy making ALL my orders, a few stand out to me. Most of my orders are for the Dayton and Cincinnati areas and every few months, I meet my sister in Kentucky and I bring her orders for the teachers at her school in Tennessee. It should be no surprise that I love anything that involves the color Pink. I had a few orders in Cincinnati and plenty more in Tennessee for Valentine’s Day. 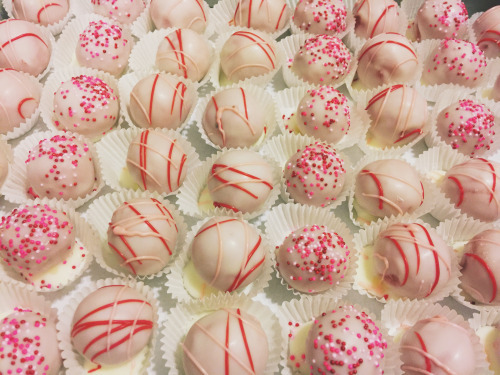 I made strawberry, red velvet, and chocolate cake balls with pink and red drizzle and sprinkles. 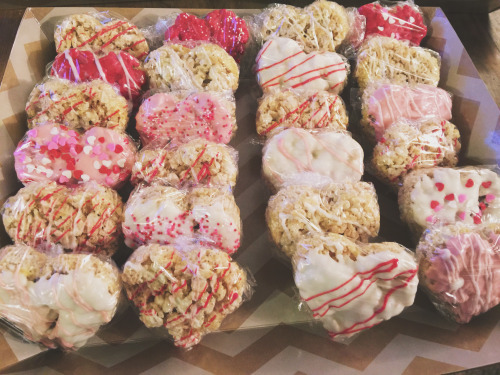 Additionally, I made heart shaped rice krispy treats with the same decorations as the cake balls. I got many positive reviews from my customers on these, and I had a blast making them! I started my business in November, so Christmas was my first “busy season.” I had orders almost every weekend for customers in Dayton and Cincinnati. These festive cake balls were fun to make and I enjoyed looking for new sprinkles everywhere I went. I used the standard red-and-green drizzle and sprinkles for all my orders. These were great for Christmas parties and family gatherings since it takes the stress off of making something from scratch. This might be my favorite order so far! I had this idea in my mind for a while and I was waiting for someone to ask me about a gender reveal cake ball. Finally, someone I went to high school with approached me about a gender reveal and I told her my idea. She liked the thought of having a cake pop with a pink or blue center. I let her choose 2 flavors so the center would really POP and so nobody could see a pink or blue tint through the almond bark. I hope to have more orders for these soon! I can’t wait to share more orders with you guys in the future! If you have anything you’d like me to try, please send the idea or recipe to littlepinkbakeryohio@gmail.com and you might just see the recipe on this site soon!